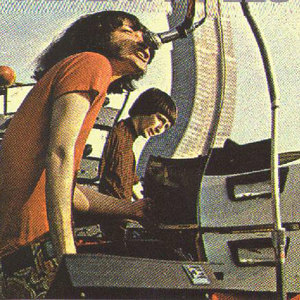 Silver Apples is an electronic/psychedelic duo which formed in 1967 in New York City, New York, United States. They originally consisted of Simeon Coxe III (who played a custom home-made synthesizer known as the "Simeon") and Danny Taylor (drums). The duo split in 1970. The group was reformed in 1996 by Simeon and new drummer Xian Hawkins. Danny Taylor returned to the band in 1998 and the band toured and recorded as a trio until 1999 when Simeon was injured in a car accident. The band returned to making music in 2006, but without Taylor, who died in 2005. Contrasting the flowery psychedelic rock music of the late-1960s, the new york city-based Silver Apples created an avant-garde sound based on little more than a homemade synthesizer (named the Simeon after their lead singer - Simeon) and an extensive drumkit, originally played by Dan Taylor. They reformed in the 1990s, making new records and playing live again. Silver Apples were one of the first groups to employ electronic music techniques extensively within a rock idiom, and their minimalistic style, with its pulsing, driving beat and frequently discordant modality, anticipated not only the experimental electronic music and krautrock of the 1970's, but underground dance music and indie rock of the 1990s as well.